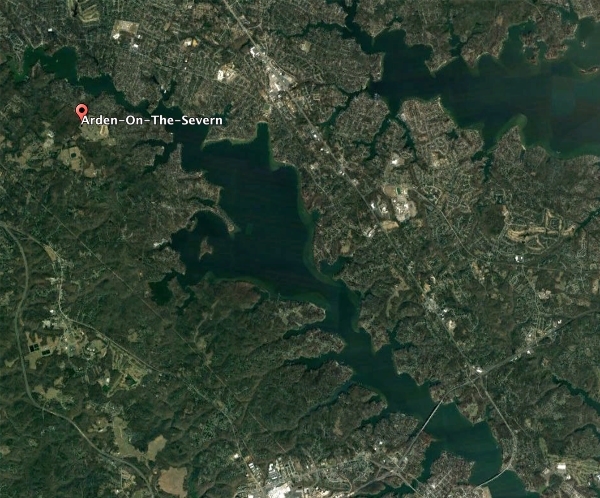 Arden On The Severn is set in woodlands bordering the Severn River, within the town of Crownsville, Maryland. A hand-powered Arden ferryboat was an undertaking of a local man who was one of the early residents of this area long before it came to be a town. He also used the barge for gigantic fireworks displays on the 4th of July. After the Civil War, Arden became the center of a somewhat famous, local mining enterprise. The sand being mined was as white and soft as flour and was extracted from the hills of Arden by stripping and tunneling. The sugary, white material being extracted was a special grade of sand, said to be the finest glass sand in the country. To most people now, the thought of a quiet, modern neighborhood being a mining operation for the most sought after glassmaking sand in the country seems a little far-fetched. Historical maps from 1878 of the Arden area shows a note indicating glass sand between Plum and Valentine Creeks, but the history of the sand mining operations is much richer. At first, the mining operation involved strip mining at Halfway Point, which is now known as Beach Four, located off of Valentine View (Section Four). Later, caves were tunneled into the hillsides off of Whitney's Landing Drive. In 1885, the Annapolis Glass Works opened on Horn Point in Annapolis. Sand was dug from shoreline pits (on both sides of the Severn River) by companies that included the Brenan Sand Company at Forked Creek and the Liberty Sand and Gravel Company at Stevens Creek. The mines provided labor for about 20 or so men from the local area. They carted the sand out of the caves with wheelbarrows, dumped it into cars that spilled the sand into cleaning bins. These bins, equipped with a steam driven worm and filled with water, filtered out the clay and oozed the baking soda-like sand onto waiting barges. The barges took the material downriver to the Chesapeake where it could be delivered to glassworks. The mining operation produced intricate tunnels dug into the banks of the Severn River, especially in the Arden area. These "caves," were literally caves, and not mine shafts because no shoring materials were used. They were hollowed out cathedral fashion, providing their own natural support. However picturesque this may have been, it was a wasteful form of mining which left half the usable sand in the hillside. Also, it wasn't the safest method. According to one story, some sand thieves got their comeuppance in the caves one night. They came up the river by schooner in the darkness and began to shear sand from the walls of a cave. Disturbing the natural structure, they were flattened by a wedge of cool, heavy, white sand and were eventually found by the employed day-miners. Around 1910, the mining operation was abandoned by the companies that operated around Arden, but the tunnels and caves became a local attraction. Cold and dark, they became a favorite adventure spot for young explorers and a retreat for young lovers. It was nearly 30 years or so before the caves were closed by authorities for everyone's safety (and for parents' peace of mind) and with them a reminder of Arden's industrial past. After the mining operation in and around Arden was abandoned, and the original settlement of Arden On The Severn was created. It is not officially known how Arden was named. Given the strong connection between Anne Arundel County and its British roots, it is thought that Arden shares its name with the ancient Arden forest in England. Surveys from 1911 show the settlement of Arden comprised about 600 acres and extended from Whitney's Landing Road along the Severn River to Plum Creek Drive. Originally, Arden did not include Sections Four and Five. Most of section Two was then privately owned. Before the 1920s, the Crownsville area was mostly farmland, but over time four large communities were developed; Epping Forest, Sherwood Forest, Herald Harbor and Arden. For many years, only two homes (located on the Omar Road extension) existed in Arden. At that time, Beach Shores, Incorporated bought the surrounding land, cut roads, surveyed lots, and started an advertising campaign for a new beach community called Sunrise Beach. At the time, they envisioned a community of summer cottages, with perhaps a few year-round residents. Many early residents built summer cottages (most of which were later converted for full-time occupancy) but a handful built year-round homes to begin with. By 1955, approximately 30 families were living in the five sections of Sunrise Beach. All of the streets were gravel topped, and to go from one house to another, you needed a flashlight to see the way. Realizing that many improvements were necessary to make this a desirable area in which to live, some of the original residents formed the Civic Association of Sunrise Beach. This group was then incorporated under the laws of Maryland as a non-profit organization. Charter members of the Association included almost all the families living here at the time. Learning that the area was formerly known as Arden, the members of the first civic association adopted the name of "Arden On The Severn" to create an aura of permanence for the community.